Finnish company Suunto is known worldwide for making high-end dive computers, and the Suunto Eon Steel lives up to the reputation of the company and the brand. The rechargeable battery, Bluetooth capabilities, and support for up to 10 pods help to make this dive computer robust enough for even the most advanced divers. The Eon Steel has won multiple awards, including 2015 Product of the Year from the Diver Awards, 2016 Best Dive Computer by TAUCHEN Awards, 2015 iF Design Award, and 2015 Most Innovative Product from Sport Diver Awards. The Suunto Eon Steel is remarkable for its construction, and for its functions. The stainless steel design, vibrant color screen, and advanced technical capabilities make this dive computer essential for technical divers who want the very best equipment. The ability to customize features and views make it a great choice for advanced divers who know exactly what they want in a dive computer and expect it to deliver. Below is a video overview of the Suunto Eon Steel by the guys over at SimplyScuba.com. In the video, you can get a closer look at some of the features and functions of the dive computer. The large, bright, easy-to-read display can be worn on the left or right wrist and flipped for operation with either hand. Charges in 4 hours and delivers 20-40 hours of dive time per charge. Suunto DM5 software allows you to download your dive data for advanced analysis and detailed dive planning. Tag, organize, and compare dives in DM5 and the Movescount mobile app, adding pictures and maps for sharing. Stainless steel bezel, robust construction, Xensation glass, and extensive testing with a guaranteed 150m depth make this dive computer extremely reliable and durable even in difficult conditions. 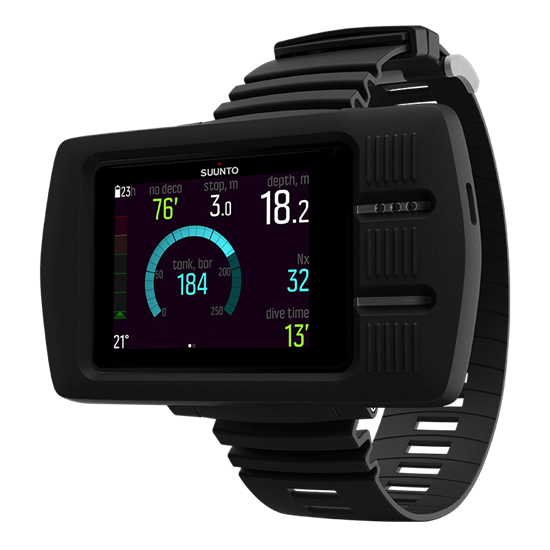 The proprietary algorithm maximizes bottom time, but also shows real-time gas consumption for those who want to monitor breathing rate and prolong dives. The Suunto Eon Steel features convenient wireless pairing with Suunto Tank PODs, and can monitor readings from 10 different transmitters with 10 different gases, with labeling fields for each diver. It also has custom setpoint capabilities and automatic switching. This dive computer can do nearly everything a tech diver dreams of. It is expensive, but feature packed. The Eon Steel impresses at first glance, with the large display, substantial weight, and quality construction. The bright display remains crystal clear and easy to read during a dive, and the rechargeable battery means you don’t have to worry about shortened downtimes due to the always-on LED. The advanced customization features on the Eon Steel are impressive, and regular software updates continue to add new enhancements and refinements. Wireless pairing with the Suunto Tank PODs is fast and convenient. In designing a dive computer easy enough for newcomers and sophisticated enough for experienced divers, Suunto’s safety measures don’t quite hit the mark for either group. New divers find the many notifications, warnings, and alarms potentially overwhelming and confusing, and experienced divers find them too conservative and potentially limiting of dive times. It’s probable that some of these features are driven by a desire to reduce liability and comply with the strictest of safety standards, but the large number of warnings and alarms, and limited ability to customize them, can be a drawback for some users. In addition, the tendency of the Suunto to react to an error by returning an error message and locking up for 48 hours offers less flexibility than other products, which will adapt to a failure to switch tanks or missing a deco ceiling by recalculating for current conditions. The exceptional design and clean display of the Suunto Eon Steel make it easy to use, with a range of advanced features and customization options that make this dive computer powerful enough for even the most advanced divers. The Eon Steel will appeal in particular to technical divers who want advanced data and analysis of their dives. The excellent construction and durability, range of features, and ongoing software updates make the Eon Steel an investment in your dive kit that will last for years to come. The Eon Steel might be too complicated for newcomers, with features and data that might become confusing or too much to manage. Many new divers don’t want to spend their time buried in a manual; they want to be diving. Some advanced divers and instructors express frustration with the Suunto algorithm lock logic, finding the ascent calculations to be too conservative and the lockout to be too aggressive. For those who are already familiar with the Suunto RGBM algorithm and welcome its conservative behavior, the Eon Steel is an exceptional dive computer. Will my old Suunto Transmitter work with the Suunto Eon Steel? No, transmitters are not backward compatible for this model. The Suunto Eon Steel has everything an advanced technical or technically inclined diver needs, with a rugged design and vibrant display that won’t disappoint. For those divers who want these features from the team at Suunto, the Eon Steel is well worth the price. It’s a definite buy, if you can afford it.